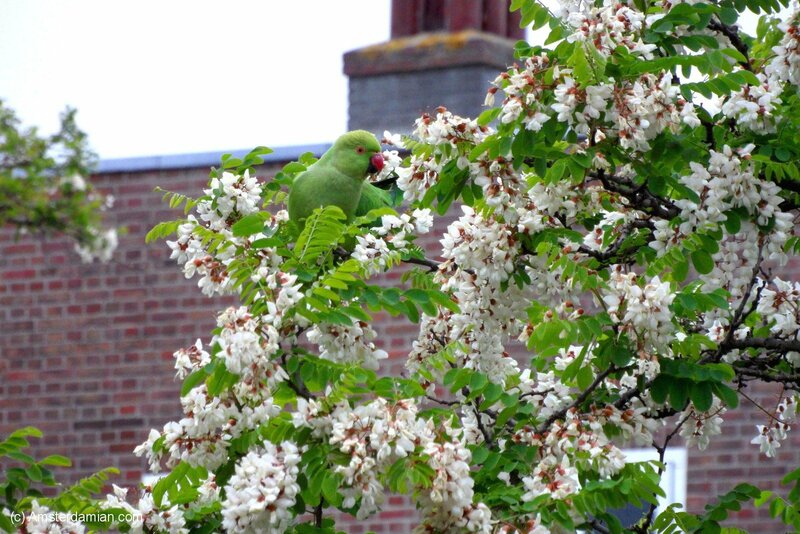 Among the first strange things I noticed when moving to Amsterdam (yes, there were a few) was a green parrot, nesting in the large tree which stood in the backyard. Bear in mind it was the middle of winter, so I was really surprised about how that small exotic bird could live outside during such weather; but the bird itself appeared to be quite happy. Over the next few days, I noticed that it also had some… family and friends — there were actually five parrots living in that tree! 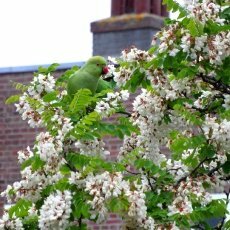 Then I recalled an article that I had read in the newspaper about the increasing number of wild parakeets living in the UK, and I thought that it could be the same situation in the Netherlands as they were quite close after all (not surprisingly, the story turned up indeed to be the same). 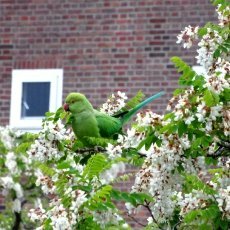 After a while, I got used to seeing green parakeets (this seems to be the right name, and not “parrots”) in trees all over the city. Once I even saw two or maybe three large flocks flying over the canals and fighting about something — maybe nesting spots, who knows? 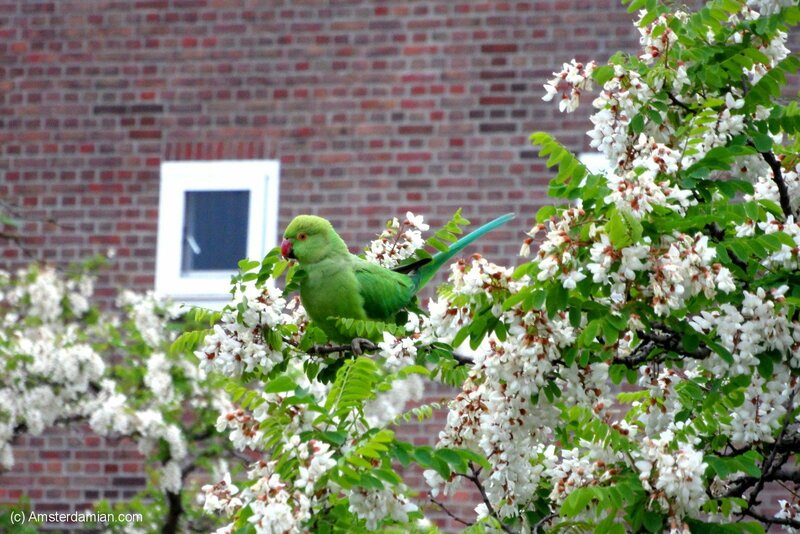 I did a bit of an investigation and found out that the first group of parakeets living in Amsterdam was observed in 1976, and it is thought they were the descendants of pets set free by their owners. Since then, these birds which have their origins in India and Sub-Saharan Africa have grown in number — over 3,000 in Amsterdam and 10,000 in all of the Netherlands — flourishing throughout the country. They are very adaptable and don’t have any trouble finding food and shelter in the (not so) cold Dutch winter, and actually thrive all over western Europe, especially in Belgium and the UK. Specialists there are even afraid that the parakeets could pose an ecological threat to local bird species, because of their competition for food and nesting locations. You can follow Amsterdamian on Instagram and Facebook for daily stories about life in Amsterdam. i have recently moved to the neatherlands (rotterdam). 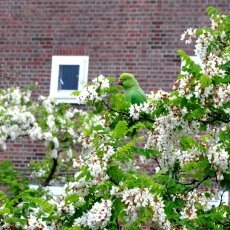 a couple of days ago i saw a green parrot on the back fence eating some berrys. i thought it was strange to see a parrot in the wild in this part of the world but put it down to maybee it belongs to someone and has escaped. then today i noticed one fly past the front window so i got up to look and there was four sat in a tree across the street. surley four hadnt escaped? so i came online to investigate and to my surprise its not uncommen to see these what i have now read are green parakeets in this part of the world. what a nice bird to look at. 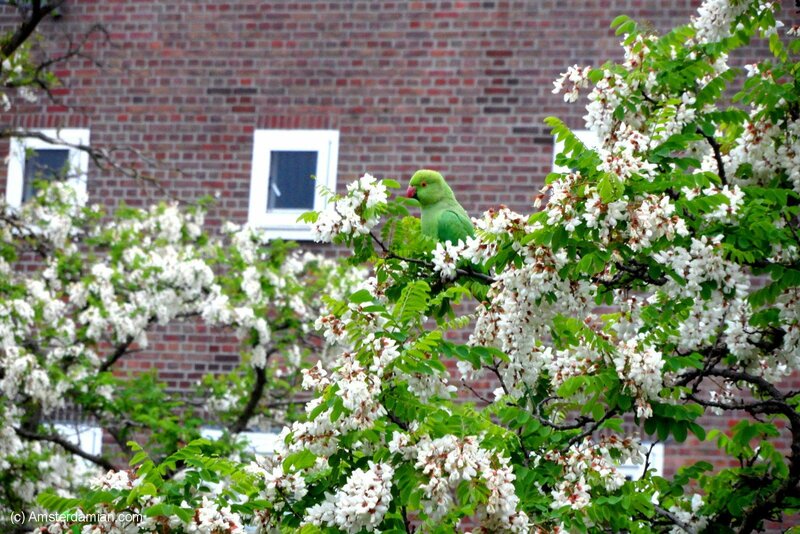 Just to be clear these parakeets weren’t here before aprox. 2010. 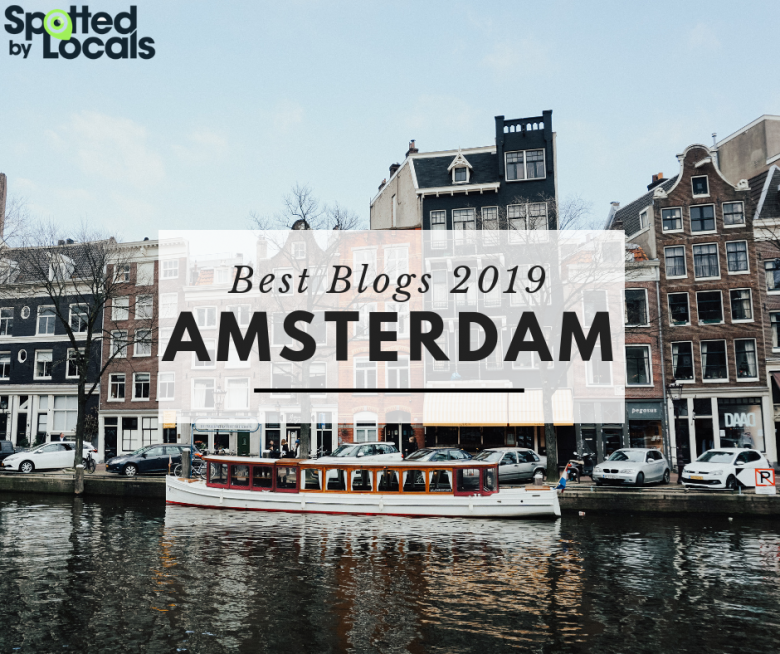 Then they were here with a few hunderd localy in Amsterdam. They all lived together in the few parks. From that year onwards they spread out over the city and started to migrate inside the Randstaf metropolis. You won’t really find them outside of the city because they haven’t migrated that far. So they only live near the metropolis Randstad.